On this page, you'll find out how to build such a circuit using a microcontroller. 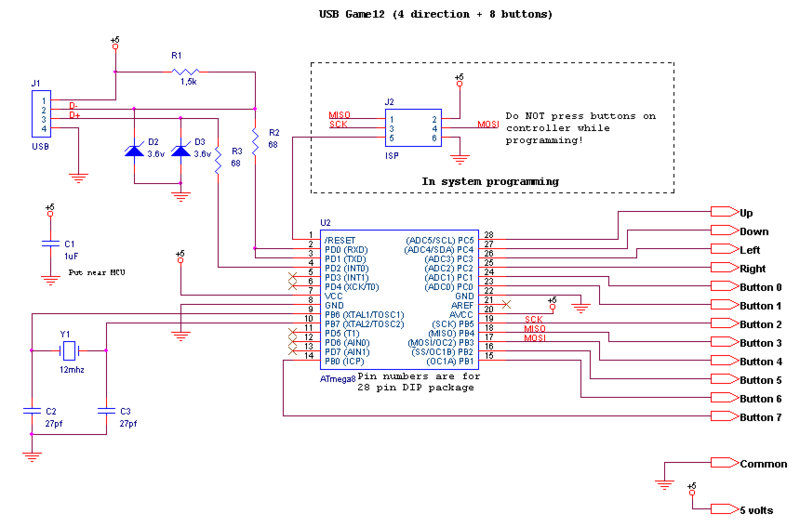 The firmware implements a standard USB joystick with 4 directional buttons and 8 general purpose buttons. Depending on your skills, you can build the circuit on a breadboard using thru-hole components or build the surface-mount version using my small multiuse PCB2 circuit board. I also sell ready to use circuits and pre-programmed Atmega8 chips (in DIP package only). Visit my online shop for more details. 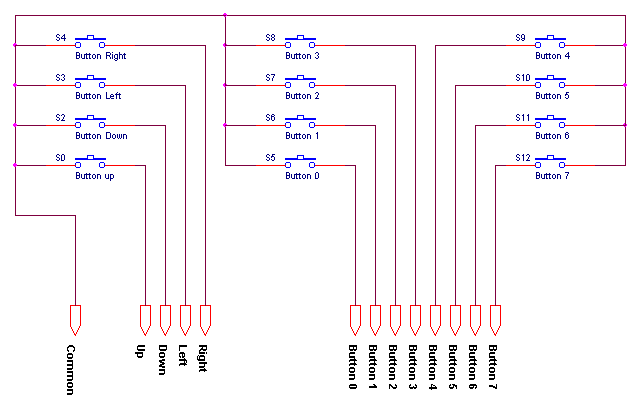 Additionally, a wiring table for NeoGeo controllers is shown lower on this page. U2 Atmega8 microcontroller. ATMEGA8-16PC, ATMEGA8-16PI, ATMEGA8-16PJ or ATMEGA8-16PU. Dont use an ATMEGA8L-*, the 12Mhz clock would be too high. R1 1.5k resistor. Ordinary carbon film 1/4 watt resistors will do. R2, R3 68 ohm resistors. Ordinary carbon film 1/4 watt resistors will do. D2, D3 3.6 volts zener diodes. R4 Do not install, not used anymore. D1 Do not install, not used anymore. C2, C3 27 pf capacitors. If the crystal datasheet recommends another value, use it instead. C1 10uf capacitor. Install it near the ATmega8. JP1, JP2 Jumpers. You can also use dip switches, ordinary switchs or solder bridges. J2 6 pin header, 2.54mm spacing. Needed for programming the ATmega8. Many microcontrollers have what is called 'Fuse bytes'. 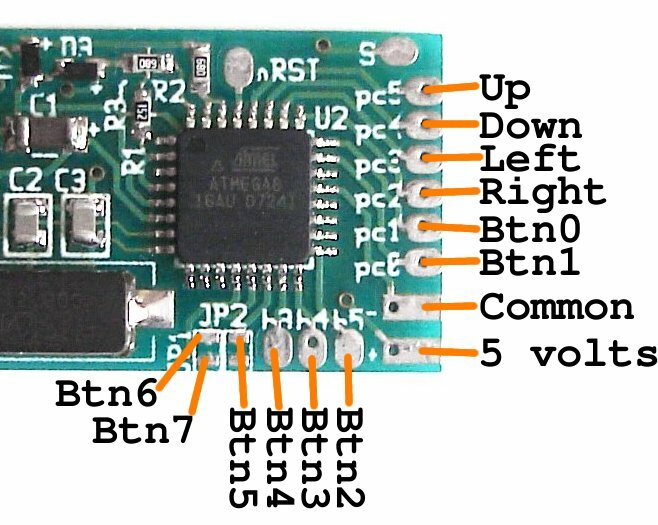 In the case of the ATmega8a, there are two bytes: The high byte, and the low byte. Those bytes are used to configure some aspects of the microcontroller. What type of clock to use? Crystal? Resonator? Internal RC clock? Allow programming via ISP? It's very important to set the fuses to the right values. Using the wrong values can render your MCU unusable. For details about how to program an AVR, visit my AVR programming page. The source code is released under the GPL license and compiles with avr-gcc. To prevent conflicts, please do not distribute modified version where the USB report descriptor has been modified without replacing the USB Vendor ID and Product ID by yours. This project is also available on GitHub! I cannot be held responsible for any damages that could occur to you or your equipment while following the procedures present on this page. Also, I GIVE ABSOLUTELY NO WARRANTY on the correctness and usability of the informations on this page. Please note, however, that the procedures above have worked in my case without any damages or problems.